Three Points are taken at random on an infinite Plane. Find the chance of their being the vertices of an obtuse-angled Triangle. Note: An obtuse-angled triangle is one that has an angle measuring more than 90 degrees. “infinite Place” is a typo, albeit an evocative one. I think it’s obvious that for any two points, when we randomly place the third point to form a triangle, there are the same number of possible obtuse and acute triangles (and for that matter right triangles and isosceles triangles) in that, for a given base defined by the first two points, all possible obtuse triangles can be placed in a one-to-one correspondence with all possible acute triangles, as well as with all possible right triangles. So, in that sense, an equal chance of being obtuse or acute (or right). I hesitate to say 1/2, though, since we’re dealing with infinity here. Extending and amending my previous testimony…. Even though the even numbers have a 1:1 correspondence with all whole numbers, I think we’d like to say that we have a 1/2 chance of picking an even number randomly from the big bucket of all whole numbers. In that sense, one (this one, anyway) has an intuition that the chance of an obtuse triangle is arbitrarily close to 1. On the other hand: what exactly do we mean by choosing a random element from the set of all real numbers? I don’t think it’s obvious what that might mean. I’ve corrected the typo — my error, not Carroll’s. ;-) Thanks. As to the meat of what you said, dealing with infinity is certainly slippery at best. Whatever it means, though, I can’t reach the intuition that you mention, particularly as intuition. By the same argument, wouldn’t the chance of *not* getting an obtuse triangle also be arbitrarily close to 1? I won’t take a stab here at attempting to define what I mean by random and thereby step on my tongue. Instead I will say that Carroll didn’t seem to have any unusual conception of it and his proof is geometric rather than relying on clever statements of relationships among the infinite possibilities. This doesn’t clarify anything, I realize, nor is it a claim to “correctness” in any sense, but it may provide a manner of focus to allow approaching the problem as Carroll intended and to come up with the answer he came up with. Let A and B be the two most distant points of the three. Disregard as essentially nil that the three points are co-linear. You can now bound the location of C and know other things about it. Since you are now talking about a finite space in that bound, Carroll’s notion of random includes that point is equally likely to be at any point in this bound space, and thus ratios of areas constitute probabilities of where the point will be. There is a conceptual problem with choosing a point on an infinite plane such that all points are equally likely. Choose 3 points A, B and C. Is B or C closer to A? Each is equally likely. But having chosen B there is a finite area which is closer to A and an infinite area which is further away, so C will certainly be further away from A than B. If you consider C before B then the same argument shows that B is further away and C is closer to A. You have the same problem choosing a positive integer at random so that all integers are equally likely. For example suppose you choose two integers, n and m, in this way. It is equally likely that n or m is the smaller. Having chosen n what is the chance that m is smaller or larger? As there are an infinite number of integers which are larger than n then it is certain that m will be one of those, so m is larger than n. But we could use the same argument to show that n is larger than m so this is absurd. The probability of choosing a particular integer, k, must tend to zero as k tends to infinity. This is necessary so that the sum of the probabilities is one rather than infinity. In the case of an infinite plane the probability density function must integrate to one. This means that it must tend to zero as we travel to infinity in any direction. I suspect there are ways of generating random triangles such that this works. Perhaps if you choose three points on a disk and throw away triangles with two points within a certain distance of the edge. I was looking at the problem from a different point of view: constructing a the random triangle by choosing, successively, three random points (which I continue to think is a fuzzy step in itself). Choose randomly the first two points A & B, call them the base of the triangle, and then consider the triangles defined by choosing the third random point C. If C is outside the area defined by sweeping the AB line perpendicular to AB, we have an obtuse triangle (there are some additional obtuse triangles obtained if C is within that area and sufficiently close to AB, but I’ll ignore them). It seems intuitively clear (to me) that there are in some sense “more” points available outside the AB extent than within it, since AB is of finite length and its extension is not (though they have the same cardinality, which gives me a headache). Carroll’s approach, in effect, says: choose two random points A & B and then constrain the third random point C such that AC and BC are shorter than AB. Doesn’t that beg the question? I think the only coherent definition of choosing a random point in an infinite set is to take the limit of choosing a random point on a finite set, in the limit as the size of the set goes to infinity. Most problems succumb to this kind of a formulation. For example, the concept that half of all positive integers are even. Or that of two random positive integers, it is equally likely which will be larger. These are approximately true for any finite set, but not exactly true, since there is a possibility of one more odd than even number to choose from, or the possibility that a and b come out equal. But in the limit as the size range goes to infinity, these possibilities happen with 0 probability, so we get the simpler result that p = 0.5 in each case. However, the question of whether a random triangle is obtuse does not succumb to this kind of formulation. In fact, it completely depends on the shape of the region from which you draw the points. Since (basically) any shaped region becomes the infinite plane in the limit of the size going to infinity, you can obtain any answer you want. For example, picking the points from a circular region yields the result p(circle) = 9/8 – 4/pi^2 ~= 0.720… (Woolhouse, 1886). On a unit square, the result is p(square) = 97/150 + pi/40 ~= 0.725… (Langford, 1969). Given two points A,B, choose another point C at random subject to the constraint that AC,BC < AB. Then, what is that probability that ABC is obtuse? So I think it’s clear that picking two of the three points does not yet determine the problem. Its really the third point that makes all the difference. Let the first two points be A and B and the third one be C.
Picture two lines perpendicular to segment AB, one which goes through A and the other which goes through B. These two lines divide the plan into three regions, namely, the region between the parallel lines, the region on the outside adjacent to A and the region to the outside adjacent to B. Any point C that falls on the parallel lines will form a right triangle. Any point C that falls between the lines will form an acute triangle. Any point C that falls outside the two lines forms an obtuse angle. We ignore the possibility that the three are collinear. So the probability would be the ratio between the two “outside” regions and the whole space. Cherry Ng shares my visualization of the problem, with a small caveat: there’s a region between the two perpendiculars, close to AB, where the angle ACB is obtuse, and a curved line x^2+y^2=1 where ACB is a right angle. I drew a picture. The picture assumes that we’ve done a coordinate transformation to make AB a unit line and put C (unshown) in the first quadrant. A little googling shows that a lot of ink has been expended on this particular problem. The only universal conclusion seems to be that Carroll’s solution is mistaken, and that the stated conditions are at best problematical–ill-posed, in Mike Jarvis’s words. One semi-satisfying approach to the problem is to change the conditions, implicitly or explicitly, from “infinite plane” to a large but finite plane with a discrete coordinate system. If we do that, though, it appears that the probability of an obtuse triangle depends on the shape of the plane’s boundary (is it an arbitrarily large circle, or square, or what have you? ), as Mike again points out. This very dependency ought to make us suspicious of extrapolating any answer to the “infinite plane”. Let’s reign in the insanity of this by recalling a few old classic theorems. AAA theorem states that two triangles that have the same angle measures are similar (not necessarily congruent). Next, (I don’t recall the name of the theorem) states that any three points are cocircular. Considering this, any circle drawn on a plane will have an equal distribution of triangles of all arrangements of angles. Therefore, any circle will represent the distribution of all other sets of triangles sharing circles on an infinite plane. Now that we have fixed some factors, let’s draw a circle on a cartesian plane and put point A on the positive X axis at (1,0). Point A is fixed. Point B is arbitrarily on the circle, so the odds of point B being on the circle is 1. The odds of point C being on the same side as point B is 1/2 (equal sides of the circle). Extrapolate the limit in P(R) to equal zero, and that equals 1/2, but we can’t forget that you can still get a right triangle. Take a triangle ABC and find X, the centre of the circle that A, B and C lie on. Identify A’, B’ and C’ as the points on the opposite side of this circle from A, B and C.
The eight triangles ABC, ABC’, AB’C, AB’C’, A’BC, A’BC’, A’B’C and A’B’C’ are all centred on X. The operation of replacing one point with the opposite point on the circle will give one of the other eight triangles. The triangles are paired, for example ABC is the same as A’B’C’, just rotated 180 degrees about X. So we have a way of splitting all triangles into groups of eight, of which one quarter are acute. This doesn’t get round the problem that the problem is ill-defined. Since there are an infinite number of acute and obtuse triangles we could group them in different ways and get a different answer. For example we could pair every acute triangle with an obtuse triangle and get an answer of 1/2. Stephen, that’s a pretty cute argument, setting aside infinite weirdness (and an allowance for cases where A is already opposite B–the right angle cases–or coincident with B). We have a strong intuition, after all, that if we choose an integer from the set of all integers, we have a 1/10 chance of picking an integer evenly divisible by 10, even though we there’s a 1:1 correspondence between them and the other 9/10 of the integers, or all the integers. So at least in that sense, 3/4 obtuse seems pretty compelling. I recall that there is another instance to account for in my proof. 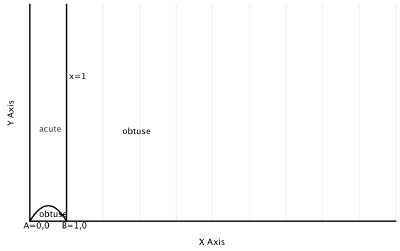 If we have our example circle on a cartesian plane, centered at (0,0) with point A at (1,0), then having one point in the (x,y) quadrant and the other point in the (x, -y) quadrant, that means half of the triangles I presumed to be acute are truly obtuse. So, the odds are actually 3/4, not 1/2. This might be the most intriguing question we have discussed on Math Factor. Jeff presented us with one of Caroll’s problems and his neat solution. We have picked apart the problem. Since then we have been searching for a way of reforming the problem so that it is true to the spirit of Caroll’s problem. Ideally we would like Caroll’s solution to be valid. That’s the ultimate goal. This is rather like the Hitchhiker’s Guide to the Galaxy, we know the answer is 42 but what, exactly, is the question? How about this for an approach. It is flawed, of course, but teasing out why is getting harder. Every triangle is associated with a circle where the points of the triangle lie on the circumference of the circle. Take a circular subset, S, of the infinite plane with radius R centred on some point. Choose three points within S at random to make a triangle, where the chance of a particular point lying within any subset of S is proportional to the area of the subset. If the associated circle does not lie entirely within S then throw this triangle away and start again. By the argument in my previous comment the triangle is part of a group of 8 triangles of which 1/4 are acute and 3/4 obtuse. All are valid because they share the same associated circle. For any triangle there is some minimal value of R for which it is valid. It will be valid for all larger values of R.
The proportion of acute and obtuse valid triangles are unchanged as we increase R, it is always 1:3. 1. Throwing away triangles where the associated circle crosses the boundary of S might seem to distort the results. We could combat this by adding another condition: “The radius of the associated circle must be less than sqrt(R).” This means that the likelihood of the associated circle crossing the boundary of S reduces to zero as R tends to infinity. It is still true that any triangle will be possible for all values of R greater than some value. I believe that fact makes this argument valid. However, perversely, the chance of having to throw away a randomly chosen triangle because the associated circle is too large (radius>sqrt(R)) increases to 1. I’m not sure what to make of that! I hope I’ve got it wrong. I don’t think it breaks the argument but it is very inconvenient! 2. I assume that every one of the eight associated triangles is equally likely. This is not at all obvious. As each particular triangle has a probability of zero it isn’t clear how to compare the probabilities of particular triangles. Again let’s change the method slightly. I take my inspiration from the Monte Carlo method discussed by Mike. Thanks Mike! We said before that the probability of choosing a point in some subset of S is proportional to the area of the subset. Choose 3 subsets of S; H1, H2 and H3; so that choosing one point from each subset always gives a valid triangle (the associated circle is within S and the radius is less than sqrt(R)). The probability of a chosen triangle having one point in each subset is proportional to the product of the areas of H1, H2 and H3. Taking our inspiration from Mike and Monte Carlo we could approach it this way. Divide S into a rough grid (it will have to be rough to ensure each section has an equal area, maybe I should have made S a square). Choose three sections from the grid at random to be containers for the three points of the triangle. If these three sections ensure that we have a valid triangle and we can determine if it is obtuse or acute then stop and count 1 to obtuse or acute. If it is not possible for any triangle chosen from these sections to be valid then start again. Otherwise subdivide each section into smaller sections, again with equal area. Repeat until we have an answer. This method is consistant choosing points so that the probability of a point occuring in a subset of S is proportional to the area of the subset. There are two situations in which we will have to go to a very fine level of granularity before we can get an answer. One if where the three points are very close together, and almost form a line. The other is where two points are close together and the third is some distance away but almost equidistant. I think these two situations are equivalent. Take the second case, reflecting the distant point across the centre of the associated circle will bring it pretty much into line with the other two. Therefore I think that the probability of coming up with any of the eight associated circles is pretty much the same. I’m not sure if I’ve come up with a genuine advance here or if the same fundamental problem exists and I’m just obscuring it with clever sounding stuff. I assume that every one of the eight associated triangles is equally likely. This is not at all obvious. Thus Stephen Morris. Can’t we justify the equal probability of the eight triangles based on the equal probability of the points? Those are zero as well, of course, but at least the original problem statement tells us they’re chosen “at random”, which in context I think we can safely take to mean with equal probability. The zero probability leads me, circularly, back to the “infinite plane” issue, though, and the practical (at least) impossibility of choosing a random real within an interval, let alone uniformly from the set of all reals. I suppose I needn’t obsess about reals; Carroll’s problem makes sense with a discrete non-dense coordinate grid, after all (though then we can’t necessarily draw our circle, can we?). But picking a random point from a discrete but infinite number line is problematical as well. Equal probability points ought to give us equal-probability triangles, and if we exclude from consideration right triangles and concern ourselves only with the ratio of acute to obtuse triangles, 1:3 seems fairly convincing, with minimal need to arm-wave away the infinity problems. The fact that we’re in the same solution ballpark as the Monte Carlo and other finite-area results is of some comfort. Well, phooey. The comment preview promised me that there would be spaces between my paragraphs. You lie! If d+ 1 points are randomly distributed on the (d-1)-sphere in R^d (d=1,2,…), then the convex hull of the d+1 points encloses the center of the (d-1)-sphere with probability 1/(2^d). The proof is trivial for d=1 and d=2. In 1975, I ‘verified’ the conjecture for d=3 with 10^7 Monte Carlo runs. I cited this result on my website schoengeometry.com (in a footnote in the paper on the Isoperimetric Problem for Polyhedra). I’m still clueless about how to prove this conjecture.